"How do you manage without a helper and still find time to blog?" is one of the most common question I get since J entered our lives. Well, the answer really is... I sometimes don't know how I do it either. Some days I am a wreak, some days it's a breeze and most days to be honest, I struggle on many levels. Everyday is different. There will be times when there's lots to do at work and that will mean rushing to shut down and tabao some work home. Somedays the boy chooses to throw endless tantrums which means lots of disciplining and TLC thereafter. On other days, he's an angel which means more gets done. It seems to get more challenging as they grow older and require more attention. I know it will eventually get better (i hope! ), but for now, we just try our best to manage. Q: So, what's your daily arrangement like? We don't have a helper, although my mum-in-law lives with us. She will help a little here and there. However, all major chores are still mine. We do have a cleaning lady who comes in on a weekday to do some cleaning and the ironing. We drive the boy to the childcare every morning at about 7am, which is near my mum's place. After which, I commute to town for work. Q: What's your after-hours like? No matter how busy I am at work, I will leave on the dot to ensure I catch the 5.40pm bus back to my mum's place. This is a private bus, so they are very very very punctual. Miss it, and the next one is not till 30 minutes later. So, if I have unfinished work, I will usually tabao it back home so there is no unnecessary delays in getting home. I arrive at the market near my mum's place. This is also when I run some household errands like buying toilet paper, dishwashing liquid, ziplock bags and other what nots. Basically things that we forget to purchase at our weekend supermarket visits. "Marmeeee! Marmeeeee!" My munchkin comes running to open the gate for me. Well, there's a rule in the house where only he can get the gate for me... no one else can. Here, he takes my hand , hugs my legs and leads me into the house. 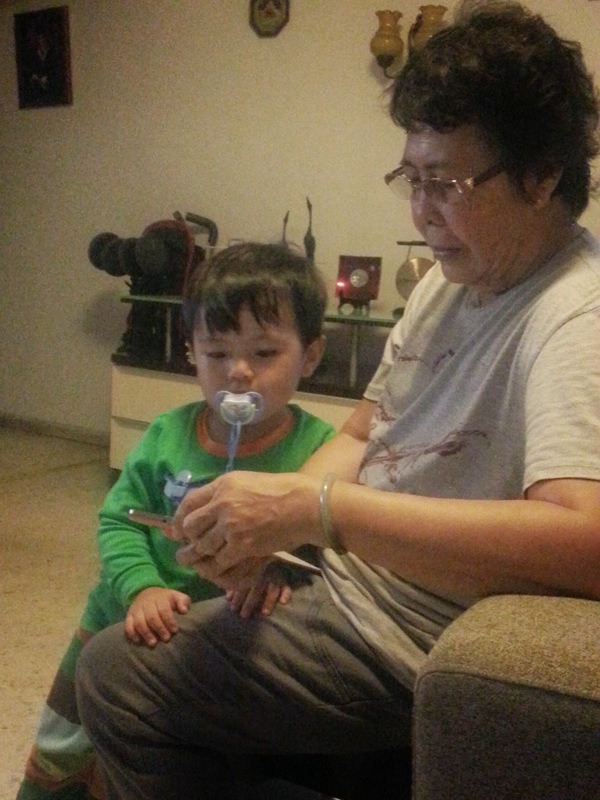 At this time he has already had his dinner and showered, all lovingly handled by his granny. J and Granny waiting for me to arrive. My mum is a real life saver. 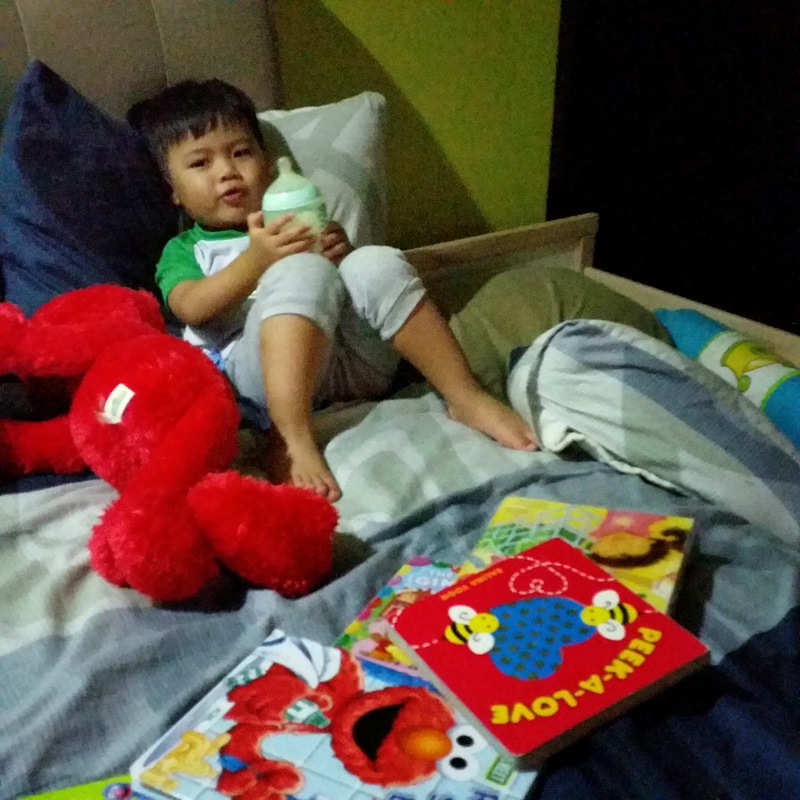 Before we moved J to his current childcare centre, my after-hours was a mad rush! I had to pick the boy from school before 7pm, feed, bath and play all the way till bedtime. Then do chores, which makes me grouchy sometimes. It depends on what time Papa arrives. On days he thinks he will arrive beyond 8pm, the boy and I will make our own way home, either by cab or bus (if I am up for it). So, technically, this is when my time is reserved exclusively for J. We will sit on the couch, with the TV on, and chat about his day. J will hug me, climb all over me, lie on my arm and tell me about his multiple girl friends... "Z (is) jojo best flen. B naughty. Teacher Joanne buy egg..." and on days he is in a good mood, he will sneak in a "Jojo lerf marmeeee." Most days , we will be in the car making our way home, occasionally stopping by the market to get our own dinner, else we will make do with what we have in our kitchen. We settle dinner while my mum-in-law entertains the boy (or is it the other way around?). On fridays, the man and I will try to squeeze in some couple time by having dinner at a nearby hawker centre. The man and I will take turns to shower. If I have the dire need to exercise, I will take this time to do that. I also use this time to unpack J's schoolbag, and handwash his dirty uniform. Of course when I get really lazy, I will just sit next to J while he busies himself with his toys and books. We retreat to the bedroom as a family. Whenever possible, we make it a point that both the man and I put the boy to bed together. J takes about 30 minutes to fall asleep, so during this time, we do silly things like tickle one another, watch the cars from our bedroom window, and talk about one another's day. Sometimes the adults fall asleep before the boy, but it is time well spent. Quietly reading after we retreat to the bedroom. One of the rare times he is quiet. On other nights. he makes a mess on the bed. Yay!!!! Time for myself (or rather the 1001 chores to be done). Laundry, folding freshly laundered clothes, picking up toys, washing of dishes, homework, blogging, baking etc. And, this is IF I don't fall asleep with the boy. The unsightly pile of clothes I need to fold. I try to hit the sack by 11.00pm and this is by the order of my TCM doctor. Oh well... the quest for number 2 is forcing us to rest more but this is where I really struggle. Nothing is ever a constant. When J throws us a curveball, all the the above don't hold any more. I sometimes go to bed making a mental list of things I need to do the next day... and the cycle starts all over again when the alarm goes off at 5.45am. Q: Any tips to remain sane amidst all the madness? Accept that the house will never be how it used to before kids. Accept that you may sometimes live out of the laundry basket. Accept that we cannot always do it all. I am still learning to let go. It's ok that the house is in a mess. It's ok that there's crumbs on the floor and dishes unwashed. What matters is we have tried our best. One of my best investments is our clothes washer and dryer. Our washer has a 18 min quick wash function which is great to rinse off all of J's clothes after I have hand scrubbed them. This function saves time and money since I need to launder his clothes every 2 days and they don't make a full load. The dryer is another life save. I used to spend a lot of time, at least 15 to 20 minutes just hanging out the laundry. The dryer cuts the effort down to just 1 minute! I have mentioned this in one of my post before. It is ok to learn from how others manage their time. But, don't fall into the trap of comparing yourself to others, and worse still, use others as a benchmark for how you and your partner should be performing. No two jobs are the same, no two families are the same either. So, do what is best for your own family. Remember, motherhood is a journey and we only become better after some trial and error. I am still learning, so I would love to hear how YOU manage as an FTWM. 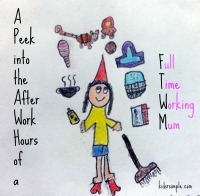 This post is part of a blog train hosted by Christy from Kids 'R' Simple on "A Peek into the After Work Hours of a FTWM". 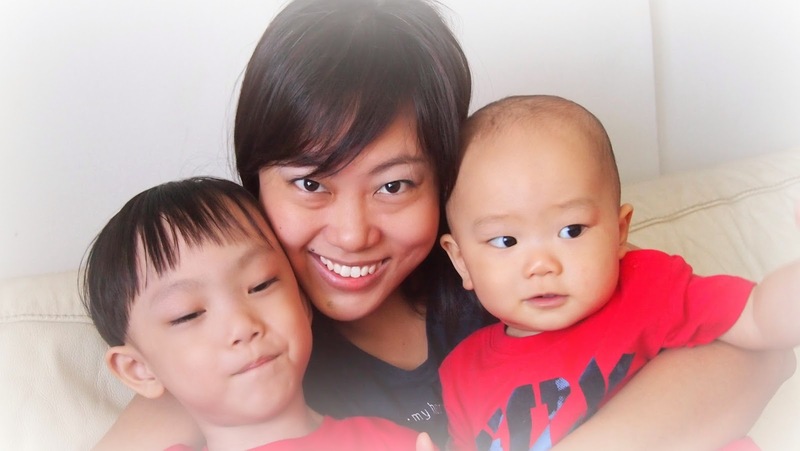 Read about how 21 FTWMs from Singapore Mom Bloggers handle their kids and household everyday from 1 June to 21 June. Next up on the blog train is Mummy Evelyn from Evespiration. A mother of 2 active boys, Evelyn shares at Evespiration on her motherhood journey and how her 2 young ones peppered her working life with WWF fights, hard-helmet knocks and stubborn tug-of-wars. If you are facing a similar war-zone reality, do read on to hear her story and how she juggles with lots of help from machines to humans! **I ran a series on Tips for Working Mommas earlier this year, and you can read the posts here.